A common thing to do in Python is to go through a directory tree, opening each file and doing something with the file's text. # Do something with each line of the file here. # Go ahead, right inside the for loop. # It's a text file, so imagine the possibilities. Here, we iterate over all the paths in the directory tree. For each path, we open the file for reading. Then we go through each line of the file and do something with it. This works well enough for many situations, but at some point you end up running into a UnicodeDecodeError when you try to open a particular file. Usually, it's because that file isn't a text file: for example, it might be a JPEG or a font file. input = b"\x00\x00\x01\x00\x02\x00  \x00\x00\x01\x00 \x00(\x10\x00\x00&\x00\x00\x00\x10\x10\x00\x00\x01\x00 \x00(\x04\x00\x00N...00\x00\x00\x00\x00\x00\x00\x00\x00\x00\x00\x00\x00\x00\x00\x00\x00\x00\x00\x00\x00\x00\x00\x00\x00\x00\x00\x00\x00\x00"
Before you go into a UnicodeDecodePanic trying out all the variants of open, io.open, unicode_open, etc., think about whether the file you're trying to open is even a text file. This is a real-life code example. In fact, it comes from a fix to cookiecutter-django's tests that I just committed this weekend, which comes from Cookiecutter core code. BinaryOrNot is a package that guesses whether a file is binary or text. I put it together a couple of years ago in order to use it in Cookiecutter. Since then, I've found uses for it over and over in various projects. 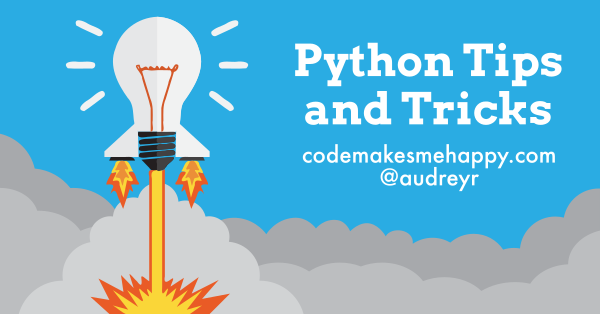 I'm @audreyr, a programmer and co-author of Two Scoops of Django. Married to @pydanny. Love Python, JS, and CSS. MIT Electrical Engineering and Computer Science, 2005. I'm also an artist, and I like to cook.